Ever wondered how to screen for thousands of diseases with just a single drop of blood? Or search out and destroy cancer cells without surgery or chemotherapy? Or texture materials to promote tissue regeneration while preventing implant rejection? These ideas may sound futuristic but they are being studied in labs right now! Nanomedicine is the application of nanotechnology to medicine. It is a rapidly expanding interdisciplinary field that seeks to develop new and improved techniques for the screening, diagnosis, treatment, and prevention of disease. 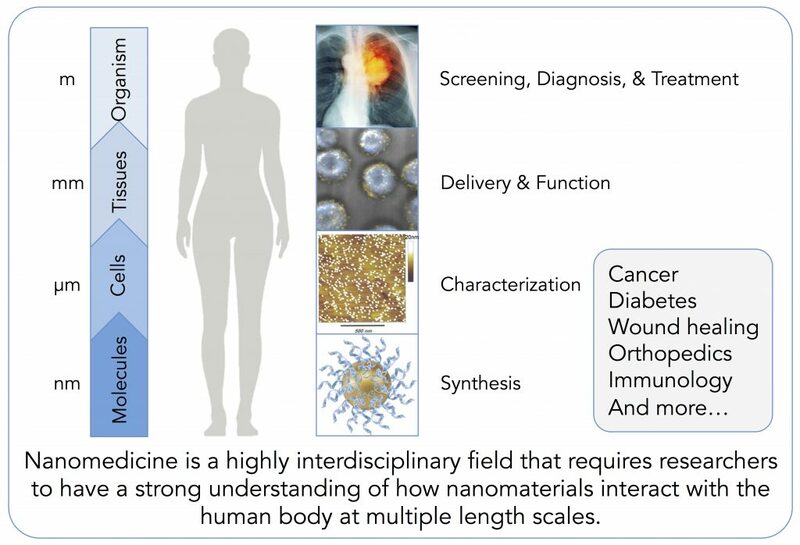 Today, nanomedicines are used for patients suffering from a range of disorders including cancer, kidney disease, fungal infections, high cholesterol, multiple sclerosis, chronic pain, and asthma. Developing new and effective nanomedicines requires an understanding of how basic building blocks assembled at the nanoscale causes unique and distinctive features that are not possible with bulk materials. These nanomaterials interact with biological structures at the scale of molecules, and thus have found widespread use for biomedical research and applications. A variety of tools exist to characterize, optimize, and predict nanomaterial interactions with cells and molecules. Upon validation in vitro, nanomaterials are tested in vivo to better understand how their delivery and function impacts behavior at the tissue scale. Ultimately, researchers hope to use these nanomaterials to improve the screening, diagnosis, and treatment of disease, provided that the nanomaterials can be proven to be both safe and effective in clinical trials. This experience provided new learning opportunities not previously available at my institution. I have never had a graduate-level course collaborating with so many schools. Nanomedicine Academy © 2019. All Rights Reserved.